We have bees! Real bees! Honest-to-goodness honeybees! Living in our house! Not on purpose, though. They kind of invited themselves into an outside wall. I like honey. My folks do not seem to be as nearly as excited as I am. 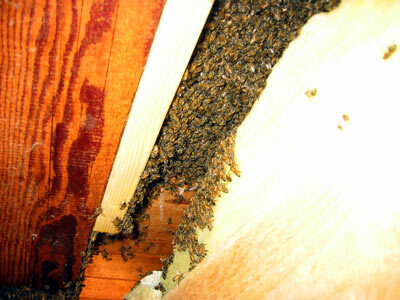 At first, they thought we were being swarmed by yellowjackets, and they locked up the dog door so we wouldn’t get stung. There were hundreds of them for a while! Then they realized they were bees. A nice man will come to collect them and will take them to a place where they can make tasty, yummy honey and meet new bee friends. How much Corgi cuteness can you stand? Let’s go visit Bruno.